We are sure that there isn’t a minute that goes by when you are not on your mother’s mind. Now you can express the same sentiment in a ring designed especially for loving mothers. 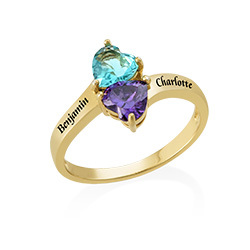 The gorgeous Two Birthstone Ring for Mom with Engraving in Silver features two crystal heart-shaped birthstones and the name of a loved one on either side. Mom can wear the ring every day or on special occasions. Each time she puts it on she will remember how loved she is.